I love trying new produce! This recipe calls for bok choy. Like me, you’re probably wondering what the heck bok choy is and where would you even find it. Well, it’s probably hiding in the grocery store right there beside cabbage. It is a dark green leafy vegetable that resembles Romaine lettuce on top and a large celery on the bottom. The entire vegetable is edible and delicious from leaf to stem. When you think of slaw, I’m sure you think of cabbage soaked in mayonnaise. 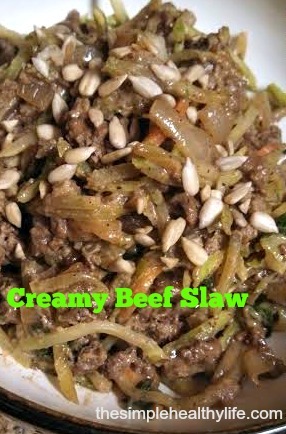 Not this slaw, it is coated in tasty and nutritious sunflower seed butter sauce. If you want to mix things up, throw this in your dinner rotation…you won’t be sorry! As always, I apologize for the poor quality phone picture! I’m waiting on someone to donate a nice camera! Melt coconut oil in a large pan over medium heat. Add onions and garlic and saute. Add the ground beef and sprinkle with sea salt and pepper, breaking up as it is browning. Once the meat is cooked through, add the chopped baby bok choy and stir. Then, add the broccoli slaw and toss. Next, add the sauce (recipe below) and stir well until all is coated. Cook for another 2-3 minutes or until mixture is heated through. Garnish with sunflower seeds. In a small mixing bowl, combine all ingredients and whisk together until smooth. Taste and adjust flavor, as desired. This entry was posted in Gluten-Free, Main Dish, Recipes. Bookmark the permalink.